With all due respect to last Saturday's college football action, Week 1 of the college football season officially starts tonight. There are 15 games on the docket tonight and eight more tomorrow, which should serve as an appetizer before the main course on Saturday. There are plenty of solid matchups on Saturday, some of which will end with playoff hopefuls taking a loss and putting themselves behind the eight-ball right out of the gate. The biggest games of the day are No. 11 Michigan vs. No. 17 Florida (+5) at AT&T Stadium in Arlington, Texas, and No. 3 Florida State vs. No. 1 Alabama (-7) at the Mercedes-Benz Stadium in Atlanta. While these two games will get all the national media attention, and likely the general betting public's attention, I'm not here to discuss them. The purpose of this weekly piece is to help you specialize in finding those under-the-radar games with soft lines in order to increase your edge over the book and turn a profit. We all know there are two kinds of bettors - "sharps" and "squares" - but what most people don't realize is that most of the sharps specialize in smaller conferences with lesser teams where the lines are softer. The reason being is that these games/teams generally fly under the radar from the betting public, thus leaving more value in the betting line. On the flip side, square bettors would be considered "generalized" bettors, which means they bet on what the media tells them to bet. If a casual bettor sees 45 commercials for Florida State vs Alabama, the chances they look elsewhere for a game to bet on is slim to none. If every casual bettor does this, there is rarely any value left in the betting line. To kick off this weekly piece, I'll break down three "under-the-radar" games from the Saturday board and give my expert picks and predictions. Records will be kept, and I will use $100 as my unit of wagers. All lines are courtesy of our friends at 5Dimes. While this game may not look attractive to a casual bettor, I believe this betting line is a tad soft and gives us some value that can be taken advantage of. This will be the Charlotte 49ers' third season the FBS, and they enter without any of the original 19 players that got them to this point. The program was elated to double up its win total from two in 2015 to four just last year. I don't expect them to improve on that mark at all. The 49ers' start the season with a trip to Eastern Michigan to face the Eagles, and I expect a very rough outing for a defense that returns only five starters while having to replace two-third of last season's defensive line and last year's leading tackler, linebacker Nick Cook. Eight of the 11 spots on defense will be occupied by either a freshman or sophomore, which means the learning curve needs to be steep in order to get productive results. On offense, the 49ers are set at quarterback with transfer Hasaan Klugh slated to start the season as the main signal caller. Klugh was solid over the final seven games last year, throwing for 15 touchdowns. However, Klugh will be in tough if the running game can't get going with two sophomores left to fill the void left by former All-Conference USA pick Kalif Phillips. Not to mention that the starting o-line returns three of five starters but may just be the weak point of the team. The Eagles, on the other hand, open the season three very winnable games, including next week at Rutgers and then home to Ohio University on Sept. 23. 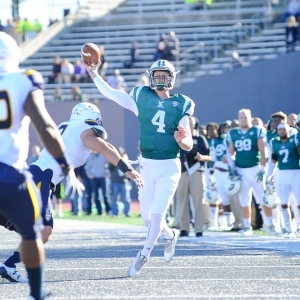 The team returns eight starters on both sides of the football, including quarterback, Brogan Roback, and all three of his receiving weapons. The passing attack should be lethal once again this year after finishing 18th in the nation with 296.1 yards per game. This is where the Eagles should make hay and allow them selves to put up plenty of points against the 49ers (309.8 passing yards per game allowed last year). I expect the Eagles to be a contender in this years MAC conference, which means I love their chances to beat a lesser Conference USA foe. Unless you are an avid follower of the Boise State Broncos, not many people know that the Broncos have won 31 games over the last three seasons but have played in the Mountain West Championship Game only once in its four years of existence. They will be in tough to double up that number as this year's team only returns four starters on both sides of the football. They will also be hard pressed to replicate last year's stats of 473 yards per game with 298 yards passing - both of which led the MWC. The best thing the Broncos have going for them is that they return junior quarterback Brett Rypien. Rypien will need to improve on his sophomore campaign while breaking in new offensive weapons. He loses the school's all-time leading receiver in Thomas Sperbeck but still has Cedrick Wilson (56 catches, 1,129 yards, 11 TDs) to hook up with. Defensively, the Broncos lost three of their top five linebackers but still have David Moa (8.5 sacks last year) to cause opposing linemen fits. For those who don't know anything about Troy, the are called the Trojans and are fresh off their first 10-win campaign as an FBS program, which included a bowl win over Ohio; they also cracked the AP Top 25 for the first time ever. Troy plays with a sense of urgency about them that is unmatched. They led the Sun Belt in points per game (33.7) and passing yards per game (260.5) while finishing second in total yards per game (429.6). The offense should be able to pick up right where it left off as it returns nine starters, including its top four receivers, its top running back and a senior QB in Brandon Silvers. The defense returns six starters, including their top two run stoppers in Jamal Stadom and Baron Poole II. This is a defensive that ranked first in run-defense (120 yards allowed per game), and third in both scoring (21 ppg) and total offense allowed (366.5). With all that said, I believe Troy is in a better spot to open the season than Boise State is, and the smurf-turf won't play a factor in determining who wins this contest. Troy is a serious contender to win the Sun Belt, so a win here would go along way to proving they are for real once again this season.